Yesterday I starting attaching sleeves on what I am currently calling Negroni 3. By the afternoon things were looking good. You'll notice I've left off the pockets. It doesn't need them. I didn't interface my left front facing but when I tested my buttonholer on two layers of my thin cotton baby-print shirting I realized that the fabric needed more support, so I added a strip of weft weight interfacing, which did the job. I think the facings on this shirt are a little too wide, don't you? I didn't flat-fell my armscye. I'm all about shortcuts at this point. Meanwhile, in glamour-girl-gone-bad land, I think I've found the perfect pattern for what henceforth will be known as the Cathy Comeback dress. I'll probably make View C -- the middle version shown here (in black) without the peplum. 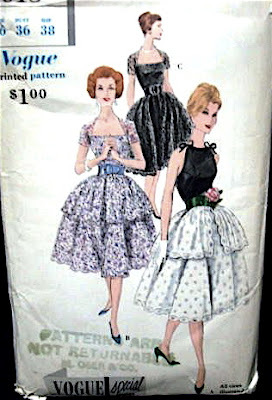 I'm not exaggerating when I say I have looked at hundreds of vintage poofy dress patterns. There are a gazillion variations. 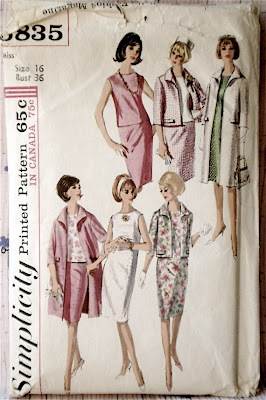 Have no fear, vintage fans, there are more than enough of these 50-year-old patterns still available to last many lifetimes. When these pattern companies spotted a trend, they didn't mess around. 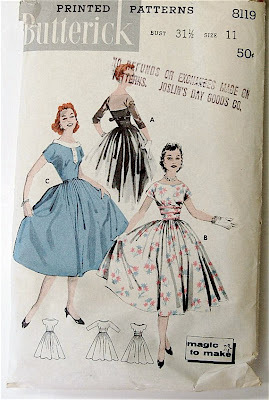 I found myself gravitating toward the circa 1959 bouffant, which seems to have been a very good year for big skirts. I like the Vogue neckline more than the Butterick below, don't you? Too Sandra Dee in Imitation of Life. I have about three yards of oyster cotton sateen and a yard of black in my stash, and I was thinking of making something like this, with the rose print worked in as skirt, coat lining, and maybe matching headband. This is from 1964, not my favorite period but one I think would be flattering to my cousin who, let's face it, is not wasp-waisted. I think a dress made entirely of the red rose pattern is a bit much and maybe not all that fun. Perhaps a satin opera coat with rose print lining? This is sounding suspiciously like a vintage Barbie outfit. I am hoping to find some Ken clothes at the flea market this weekend. I'm visualizing a big plastic Ziploc bag containing Ken's entire early Sixties wardrobe for $5. Won't you visualize it with me? Folks, we're out of time. I'm off to go doll clothes shopping. You? Don't you just love Imitation of Life? A true tear jerker! Of course, I love the original version more. Though I am not a part of the shirt sew-a-long, I do follow your blog and enjoy it immensely! Ha. 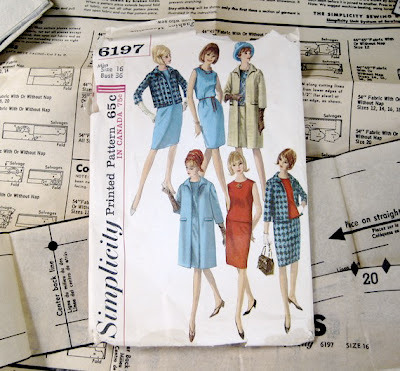 I like to refer to this a vintage pattern shopping cross eyed syndrome. 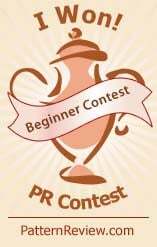 ;) I've definitely had cases of it after spending too much time on etsy or wherever going through patterns! Negroni 3 is my very favourite, Peter! I love the print and it looks really great on you. :) I say make Cathy a big poofy dress from the rose print; go big or go home, right? Good luck with finding Ken's wardrobe! I love the shirt you made, the fabric is wonderful! Also, if you only have three yards of the gorgeous rose print, I think you're stuck making the pencil skirt, the full skirts run more to 6-8 yards, I think. Either way, Cathy will be very elegant. lw, I bought 4 more! I can make drapes for every window in my apartment. I think Cathy needs to shake all those jail rumours off and have a comeback worthy of a front page - I suggest the 50's Vogue in rose print! Oh the fifties Vogue *with* the peplum to accentuate her hips, so swishy to sashay in. The view with the little shoulder ties and a pink linen shrug to go overall. Don't forget the strawberry daqueri. "Peplum" - I don't feel too bad for not knowing what that is since it appears to be something designed to make one's hips look larger than they actually are? Which genius designed that? And Peter, I feel you on the shirt weariness. I really should make another muslin before I cut into my Liberty lawn but... ack... I had to sew a pillowcase today just for a break. Quick'n'easy gratification. PS love the Swedish Chef. 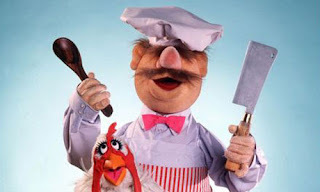 We are all about the Muppets in our household at the moment. What a surprise to see you highlight Imitation of Life in this post. Not many have even heard of it; it ranks high on my list of movie classics. One of my fave scene: where Sarah flings herself on the casket and cries out Mama! 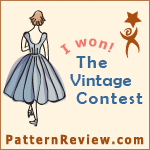 And, yes, loaded with '50's fashion! Can't wait to see your finished product. I love how in the photos where Michael makes an appearance, he is totally ignoring you. I did get tired of shirt making. I will go back to it in a little while to make him the white one as asked, but I took a break to make myself a few things and a dress for my doll Molly. I have pictures of these things on my blog. I love the shirt you made, the fabric is wonderful!